The provisions of the Foreign Acquisitions and Takeovers Act 1975 (Commonwealth) (“Act”) and Foreign Acquisitions and Takeovers Regulation 2015 (Commonwealth) (“Regulation”) apply strict rules to foreign persons purchasing a residential real estate in Australia or investment for property in Australia. A summary of some of the key issues follows. Under Australia’s foreign investment framework, foreign persons generally need to apply for foreign investment approval before purchasing the residential real estate in Australia. The Government’s policy is to channel foreign investment into new dwellings as this creates additional jobs in the construction industry and helps support economic growth. Foreign investment applications are therefore generally considered in light of the overarching principle that the proposed investment should increase Australia’s housing stock (be creating at least one new additional dwelling). 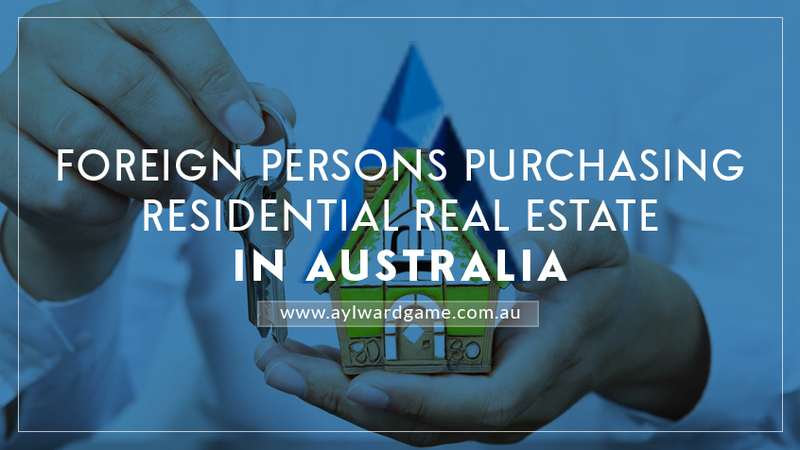 Non-resident foreign persons are generally prohibited from purchasing established dwellings in Australia. An established dwelling is a dwelling (except commercial residential premises such as hotels, motels, and caravan parks) on residential land that is not a new dwelling. Foreign persons generally need to apply and receive foreign investment approval before purchasing new dwellings. Applications to purchase new dwellings are usually approved without conditions. If the dwelling is part of a development, was sold by the developer of that development and has not previously been occupied for more than 12 months in total. New dwellings do not include established residential real estate that has been refurbished or renovated. A single dwelling that has been built to replace one or more demolished established dwellings would generally not be considered a new dwelling for the purposes of Australia’s foreign investment framework. Foreign persons generally need to apply and receive foreign investment approval before purchasing vacant residential land for development. The development is completed within four years from the date of approval. Evidence of completion of the dwelling/s is submitted within 30 days of being received. This could include a final occupancy or builder’s completion certificate. Vacant land that previously has an established dwelling on the land would generally not be considered as vacant land for the purposes of Australia’s foreign investment framework. All foreign investment applications for residential real estate are usually submitted online and are processed by the Australian Taxation Office. A competent real estate lawyer in Australia will provide this information. Foreign persons, regardless of citizenship or residency, do not require foreign investment approval to acquire an interest in a residential real estate in Australia that is a new or near-new dwelling purchased from a developer that holds a new or near-new dwelling exemption certificate that allows the developer to sell dwellings in the specified development to foreign persons. The Foreign Acquisitions and Takeovers Fees Imposition Act 2015 (Fees Act) and Foreign Acquisitions and Takeovers Fees Imposition Regulation 2015 (Fees Regulation) set the fees for foreign investment applications and notices made under the Act and Regulation. When does a fee apply and when is it paid? The fees that are payable for residential land applications depend on the price for the acquisition of the interest. A single fee applies for foreign persons purchasing residential land as joint tenants. Fees for residential real estate applications are payable when the application is lodged. Information on how to pay the fee will be provided as part of the application process. Strict penalties (including civil and criminal penalties and disposal orders) may apply for breaches of Australia’s foreign investment rules. The above is only a quick general summary of some key issues (source – Australian Government – Foreign Investment Review Board website at http://firb.gov.au/). If you require any further information or assistance in making an application, please do not hesitate to contact the property law team at Aylward Game Solicitors. And Mark Game is a solicitor with strong experience and background to help foreign persons purchasing residential real estate in Australia and is a well established real estate lawyer in Australia.